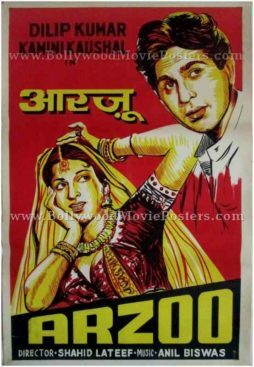 Old Indian movie poster for sale of the hit Hindi film Arzoo (1950). This is an actual surviving vintage Indian poster for sale of the 1950 film Arzoo which starred the ultimate method actor in Bollywood, Dilip Kumar in the lead role. Directed by Shaheed Latif, the film also starred Kamini Kaushal and Shashikala. Noted Anglo-Indian dancer Cuckoo Moray (known as the Rubber Girl of Hindi cinema) also portrayed a small role in the film as a dancer. Printed and circulated a few years after the original first release of the film (somewhere in the late 1950s), this old Indian movie poster for sale was printed for publicity of the film but never ended up being used. This vintage Indian poster for sale was originally designed in hand painted oil on canvas format by a small time art studio in Kolkata, making it highly collectible. The poster displays the use of bright eccentric colors, which gives it a stunning eye catching appearance. Quirky line drawn portraits of the lead couple Dilip Kumar and Kamini Kaushal are seen in yellow, set against a red background. As was the norm with localized posters of the era, this old Indian film poster has been designed and printed using only two colors (understandably to save on design and print costs). The combination of red and yellow makes this vintage Indian poster for sale stand out.